"Couch to 5k" Is A Great Beginner Running Program - Try It Here! If you need a Beginner Running Program, this routine is perfect. It starts off with interval running, meaning you take regular breaks in order to reach your total distance. A lot of people under-estimate how tough it is to run at a steady pace, and so get disheartened and quit. 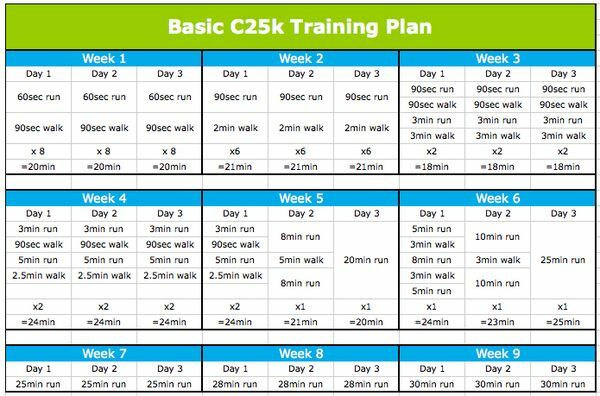 This program starts off really slowly, and by week 7 has you running non-stop for 25 minutes. Be sure to warm-up before you do each session, check out the video below for a great 5 minute warm up. So here is the program (below). Note that Day 1, Day 2 and Day 3 doesn’t mean Monday, Tuesday, Wednesday, they are just the three days of the week you choose to run on. I recommend leaving at least a day between runs in order to allow recovery. Consider downloading a HIIT Timer App that will allow you to set a “work” and “rest” interval that repeats itself. This will allow you to complete weeks 1 & 2 by simply running and walking when your phone beeps. Good luck with your training. Feel free to SHARE this program with your friends!